CINCINNATI, ohio – A 55-minute weather delay that pushed back the start of the game wasn’t about to deter a relentless St. Xavier defense. The Bombers kept host Walnut Hills to just 61 yards of total offense (46 pass, 15 rush on 26 att) and smothered the Eagles hopes of an upset. 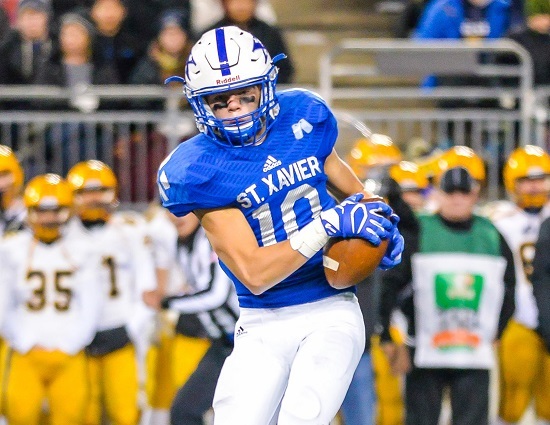 St. Xavier also held Walnut Hills to 3-15 on third and fourth conversion attempts, had four sacks, forced four turnovers and recovered an Eagles Hills fumble in the end zone for a touchdown. Linebacker Nathan Arthur was a terror for the Bombers. The senior was in on 10 total tackles, eight of those were tackles for losses including three sacks and he forced a fumble. Walnut Hills only had three plays of 10 or more yards with the longest being a 16-yard scramble by quarterback Ryan Mickens. Rising Bombers star, sophomore Liam Clifford had a 42-yard touchdown reception from Jared Kreimer a minute before halftime. Then 32 seconds after intermission he bolts 77 yards for another score. Those two trips to the end zone really broke the will of Walnut Hills. Clifford ended up with a game best 136 yards from scrimmage (88 rush, 48 rec) on five touches. Kreimer went 7-11 for 102 yards and two touchdown tosses.